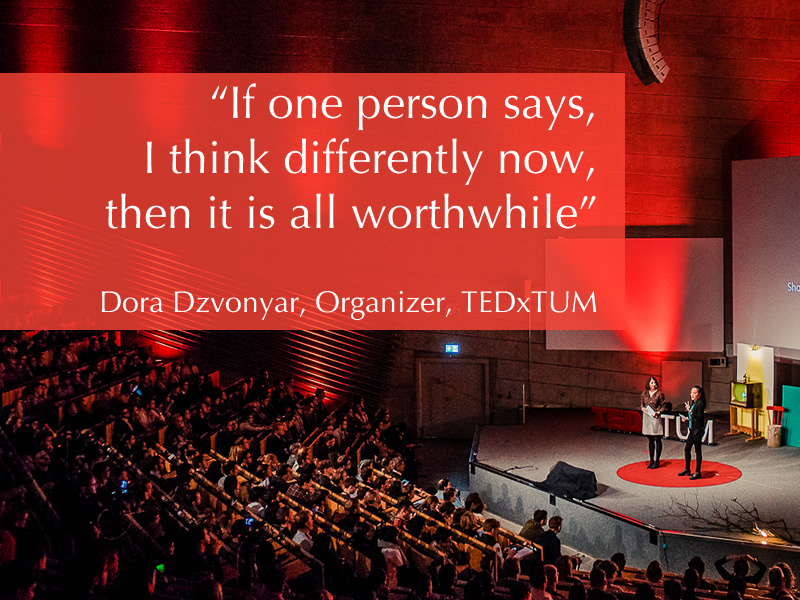 Dora Dzvonyar is the Organizer for TEDxTUM (Technical University Munich) in Germany. She’s been organizing since 2015 and has several events and produced Salons including a TEDxLive event. There are 40,000 students at TUM which is bigger than some of the towns that provide a TEDx event. She’s a grad student and teacher. She watches one TED talk a day and saw an announcement about a TEDx in a flyer and took the leap to be an organizer and never looked back. One of the significant challenges for them has been establishing a structure for the event that transcends the transient nature of being a student-run organization. They now have six team leaders, that are Ph.D.’s who are going to be around, this stable core of people is able to work well with the flexibility of the primary workforce. This is an excellent solution for a University TEDx event. An interesting anomaly that exists as a cultural consideration for the team is that in Germany, outgoing persona’s are frowned upon. Everyone, especially students, wants to be perceived as serious. They encourage a playful atmosphere to counter this behavior. When I asked her about the intrinsic awards of running a TEDx she said that if one person says, “I think differently,” it’s all worth it. I agree. Dora says that she gets a lot of ideas for her event from this podcast, thanks, we love hearing that. She also writes for Medium and calls her column, Part Time Optimism, because full-time realism is no fun. She’s been organizing TEDx since 2015 and was introduced to the idea of a TEDx at TUM by Dietrich (Co-Organizer) when he came back from being an exchange student in Australia and saw a TEDx there. Several salons, a TEDLive and a few main events. She’s been to TEDGlobal and did a workshop in Lugano. Note: We strongly encourage organizers and team members to find a workshop near you and attend. The social norm in Germany, and especially in Munich is to not be outgoing per se but to be perceived as serious. This makes being ‘playful’ a challenge for the user experience team. That I have skills, I didn’t know I had. Building a sustainable organization that relies on students on the team. Not everyone will like everything you do or every talk you put on the stage. And that’s ok.
Co-leading the curation team and introducing new ideas. She’d like to go back in time and visit TEDxVelenje (Slovenia) which was in November 2017 and was held underground in a Mine. Because 25% of a Level One event is screening recorded TED Talks, she says, invite audience members from the community to come on stage and introduce their favorite TED Talk and explain why they feel it’s essential.